Definition: In relation to appliances, a microwave oven is an electric appliance and an alternative form of cooking. Also simply called a microwave or micro, this type of oven uses electromagnetic wave technology to cook foods. 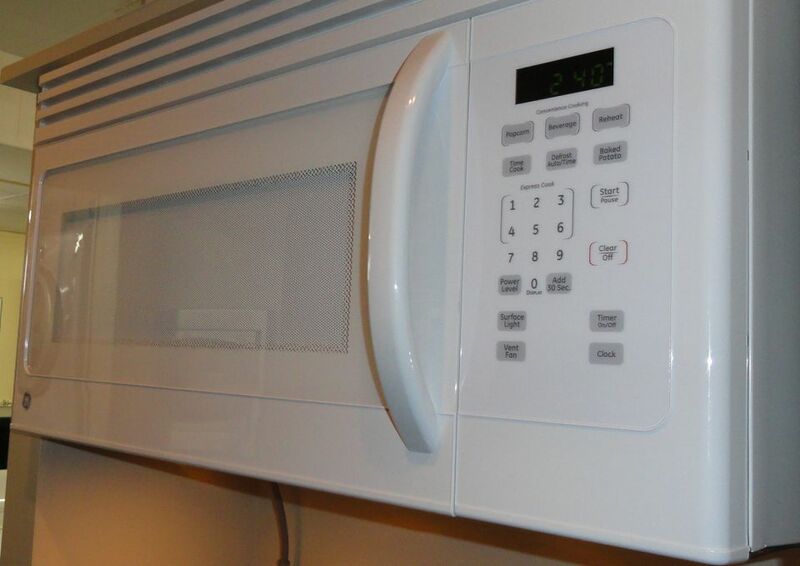 Microwaving foods is very common in North American kitchens and provides quicker warming and cooking than a conventional range oven. It's also a popular way to safely defrost meats. Rarely will a microwave replace a conventional range in the kitchen, but it provides another source of cooking to supplement or for certain foods. While most microwaves use only this type of cooking/heating technology, there are models that have dual functions - microwaving and convection cooking. And a microwave cooking function can also be found in portable or wall ovens with multiple cooking technologies. So this type of cooking can be found in combination with other cooking equipment. If you're looking to buy a microwave, be sure to read the following definition before making your decision. Microwaves are the most economical of (large) kitchen appliances and though it's much smaller than a range or refrigerator, it tends to fall in this category of household appliances. These small ovens are sold in a variety of styles including portable units that can be placed on a counter, shelf or microwave stand, as built-in models that are custom installed within cabinetry and above-the-range microwaves that combine an exhaust fan with lighting. There are also multifunction units that combine a counter microwave with a small appliance such as a coffee maker or toaster. Microwave prices vary based on heating/cooking functions, preset settings, capacity, and installation style. They are available mostly in white, stainless or black finishes. When it comes to cooking and baking in a microwave oven, consumers have mixed opinions. Though you can cook most foods in a microwave oven, there is little or no browning and the texture of baked desserts is not as desirable as those done in a standard oven. Overcooking can render very dry vittles as moisture is removed during cooking by the microwaving process. Yet many would not part with their microwave and find they use it often enough to justify the purchase. While some homemakers are creative and use their microwaves for many recipes and dishes, others use this handy appliance for melting butter, popping corn, heating a beverage or water to boiling temperature, defrosting and reheating/warming left-overs. As such to many, it is an essential kitchen appliance even if use is limited by preference. When it comes to microwave dishes, most dinnerware is fine but not every dish or container is microwavable. Steel, metal/tin, stainless, items with gold rims such as china teacups and foil wrap - just to name a few, cannot be used in a microwave. Styrofoam containers such as those from restaurant take-outs, cannot be reheated in a microwave. And most bakeware that can used in these ovens is labeled as microwave safe. Though there are some microwavable plastics, most generic plastic containers can melt or deform if placed in a microwave for an extended cooking period on high heat. There are very handy plastic items though such as plate covers, popcorn bowls and bacon dishes that are very convenient to have for microwaving. Also Known As Microwaving oven, micro, microwave.